This stroboscope light is connected via an inductive clamp to the engine battery of cars that run by Otto engines. The stroboscope light is the ideal device to easily adjust the inductive of an engine. It has to be said that this is often necessary for older engines since a too high pre-ignition leads to the engine over-heating under full throttle. The counterpart is a too low pre-ignition, which leads to a much too low engine power at lower rotational speeds. Thus, a stroboscope light helps in adjusting the correct ignition in order to achieve maximal engine power at minimal heat. Thus, a stroboscope help to find the optimal ignition point, and if necessary the ignition can be adjusted afterwards to reach the perfect ignition point. The stroboscope gets its power from the engine motor. 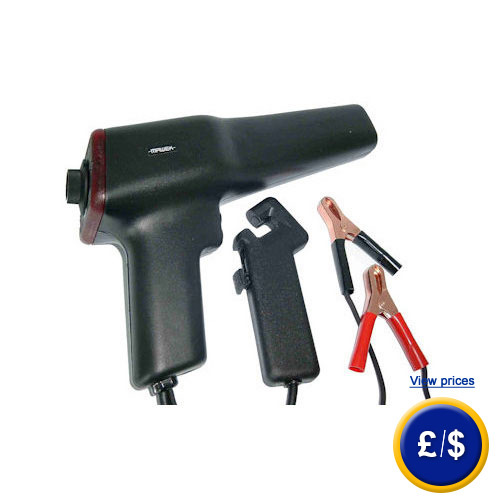 The clamp can be attached to the ignition wire between ignition plug and ignition coil. An overview of all stroboscopes in our assortment can be found here. For further information about the metering pump please read the following technical data or use our hotline: UK customers +44(0) 23 809 870 30 / US customers +1-410-387-7703. Our engineers and technicians will gladly advise you regarding the stroboscope light MP7 and all other products in terms of regulation and control or scales and balances of PCE Instruments.